In an effort to stimulate the electric vehicle market in Russia, Prime Minister Dmitry Medvedev signed a decree requiring the owners of gas stations to install charging equipment for electric cars at their gas stations by Nov. 1, 2016 according to the Moscow Times. The requirement could very well be the most drastic government action to encourage electric vehicle infrastructure in any country. The current electric vehicle market in Russia is quasi non-existent. According to car market research agency Autostat, there are only about 500 electric vehicles in the country. Electric cars and charging stations always had the chicken or the egg problem where some people think that if you build charging stations, more drivers will buy electric cars, and others think that if we would sell more electric cars, businesses will install more charging stations. But in Russia the problem seems to be the availability of electric vehicles. The only electric car currently certified in Russia is Mitsubishi’s i-MiEVs and it is otherwise extremely costly to import cars in the country. 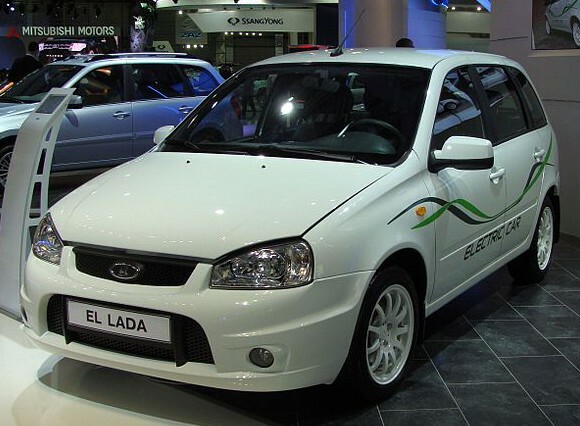 The Russia-based automaker AvtoVAZ, which is controlled by the Nissan-Renault alliance, produces the EL Lada electric car (see picture above) through a government backed program, but the production and availability have been minimal with now only 49 vehicles registered. Now if local vehicles are not really an option, you have to turn to importing, but your options are still very limited. Even Tesla’s Model S, which could be very popular with Russia’s many millionaires, is extremely difficult for Russian to buy since Tesla doesn’t operate in the country. Russian entrepreneur Dmitry Grishin detailed his difficult journey to import a Model S in this article from The Verge. The timeline of the decree is what is most impressive here. Russian gas stations have barely a year to comply. It’s doubtful that these charging stations would see much use, even if the country was to double the number of electric vehicles on the roads to 1,000 by next year, which is unlikely since Russia added only ~50 EVs so far this year. Nonetheless, the new requirement should get oil rich Russia talking more about electric vehicles.